On this page, you will find articles of general interest submitted by club members. If you would like to contribute, then please send your copy in plain text format together with any photographs by e-mail to the club secretary who will, if the article is approved, forward it for publication. As a child I loved the beach, with the cry of the gulls as they floated effortlessly on the sea breeze and the sound of the sea as wave after wave chased each other onto the soft, golden sand. I remember the fun I had, searching rock pools for fish or crabs left behind as the tide retreated and then, as the tide turned, standing at the limit of each wave as one after the other advanced onto the beach, waiting to see if the next one would make you run to avoid getting your feet wet. The combination of the sun and the sounds and smells of an unspoiled beach on a warm, summer day created a magic that has never left me. To me, as a naturist, the beach is an ideal playground, providing the opportunity for people of all ages to enjoy a day in the open air, surrounded by so many things to see and discover. Even the walk from the car can be an adventure in botany, geology, ornithology or entomology for those who find interest in such things, although I remember, as a ten year-old boy, I was far more interested in getting to the beach as quickly as possible. There are many wonderful beaches around the British coastline, all with their own, individual character. Some have sections set aside for naturism and others, like Little Strand beach, provide an environment where naturism is tolerated in a healthy co-existence with those who prefer to remain covered. Some say that Little Strand is one of the most beautiful, unspoiled and unaltered beaches in the country - possibly in Europe, who knows. But without doubt, it does offer a large expanse of clean, golden sand from approximately two hours after high water, with many rock pools for kids to explore, an area of quartz-rich pebbles with fascinating patterns, spectacular examples of folded rocks exposed in the cliffs and large boulders by the thousand, many of which make excellent sun-bathing platforms or wind breaks. Little Strand is the smaller of two beaches, the larger of which is known as the Strangles. 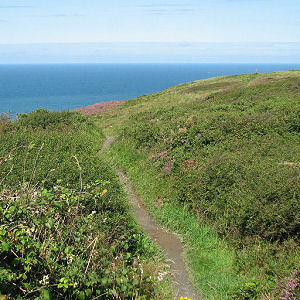 Both are located on the North Cornish coast, due west of Trevigue Farm, between Boscastle and Crackington Haven. For those who are familiar with Google Earth, entering the co-ordinates 50°43'54.59 N 4°39'02.40 W into the search bar will place you directly above Little Strand beach. Although a little way off the beaten track, the Strangles isn’t too hard to find. 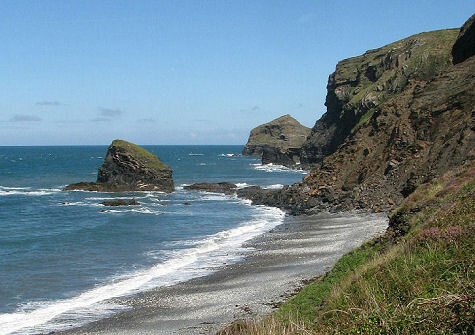 From Boscastle, take the B3263 coastal road north towards Crackington Haven. After approximately 2.8 km, turn left towards High Cliff (sign posted) and follow the single track road that winds its way, along the coast, towards Trevigue Farm. Approximately 400 metres before the farm, a lay-by on the right hand side of the road generally provides enough parking to accommodate all of the vehicles that visit this part of the coastline. 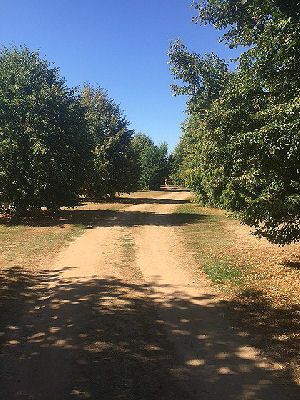 However, extra parking is occasionally provided by the local farmer during the height of the summer season, as it is obviously important to keep the roadway clear. 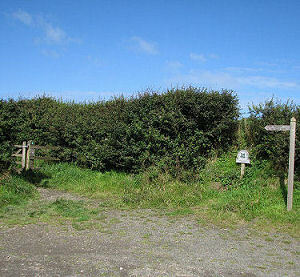 Almost directly opposite this parking space is a kissing gate, which gives access to a footpath leading towards the cliff and which joins other tracks along the way, all forming part of the North Cornish coastal path in this area. Be sure to note the route you follow, as the many paths that cross each other can be confusing on the walk back! Pass through the gate and walk between the high hedges until, after approximately 80 metres, the path veers to the northwest. After a further 70 metres, take the left fork and follow it until it meets the coastal path, which joins from your right as it follows the cliff tops on its way from north to south. Go south along this route for another 25 metres until the way down to the Strangles goes off to the right. Cross over a stile next to a gate and follow the path which, after this point becomes more steep and rocky. It must be said that the descent to the beach (and the walk back up) is not for the infirm or the faint-hearted, although most healthy people, including children over the age of eight or nine, should find it reasonably easy to cope with. 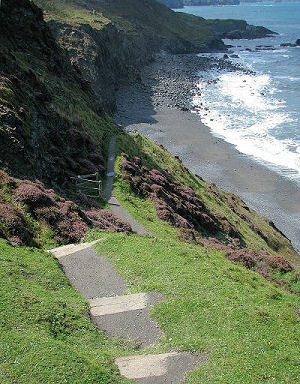 For the sake of safety however, it is essential that young children are closely supervised, particularly as the path approaches the final, unfenced 200 metres down to the beach, the last 20 metres of which involve wooden steps, ending with a climb down across a large mass of rock at the base of the cliff. Not exactly a stroll through your local park, but, for those who appreciate the beauty of an unspoiled beach, it is well worth the effort. Once safely down on the Strangles beach, turn to your right and walk, with the sea on your left, towards the line of rocks that juts out into the sea at the end of the shingle beach, shown in the photograph below. The picture below shows the Strangles beach with the tide well in but, as the tide goes out, it becomes possible to cross this line of rocks to access and enjoy what must be one of the loveliest natural beaches on the North Cornish coast. Traditionally, naturists use Little Strand (the beach to the north of the rocky barrier) rather than the Strangles, which the locals prefer to retain as a non-naturist area. To spend a warm, sunny day on Little Strand beach, clothed as nature intended, is a delight for people of all ages, but bear in mind that this is a truly natural area, without facilities of any kind, and you will therefore need to carry down with you everything you will need during the day. Of course, it goes without saying that, to preserve the beauty of special areas of coastline such as this, you are respectfully reminded to remove all your litter. As the saying goes... “Take nothing but photographs - leave nothing but footprints”. A final note on safety: both beaches are unpatrolled and, in the absence of lifeguards or life-saving equipment, it is wise to be familiar with the dangers associated with bathing off this wild and rugged coastline. It is also important to be aware of the state of the tide which, at its height, completely covers Little Strand beach, washing it clean for others to enjoy the following day. On the 30th June 2014, I visited the Strangles and Little Strand beaches and discovered to my great disappointment, that the storms of the previous winter had not only destroyed the steps which form the final six or seven metres of decent onto the beach - making access extremely difficult and dangerous, but also had lowered the level of sand. This has completely altered the characteristics of both beaches, making them predominantly rocky even at low tide. A second trip to Little Strand beach made towards the end of the summer, revealed that the steps have been repaired. Despite that however, a rope is still in place to assist the climb down over the last few metres of loose and rather slippery rock in order to access the beach. (this can be quite a physically demanding exercise, so please beware!) The beach itself is still more predominantly rocky that in previous years, but if you visit when there is a low, spring tide, the beach can be enjoyed as before, with lots of clean, golden sand. This photograph was taken in early September 2014. I have been going to this wonderful place for over 20 years, and can heartily recommend it. It is situated in the south-east of Spain, right on the coast just south-west of the old Roman city of Cartagena, in the province of Murcia. This part of Spain has probably the warmest coastline because it is a long way south but it is not affected when the cool wind blows from Gibraltar along the south coast. In July and August, when I go there, days are nearly always sunny from dawn to dusk, and the temperature varies from 32C (90F) in the afternoon to 24C (76F) at night. (For people who don't like such high temperatures, June and September would be preferable but even the winter months are not dissimilar to an English summer!). To get there, you can either go by car (and tow your caravan) via motorways all the way from Calais, or take a ferry to Santander or Bilbao, and drive from there, or go by plane from Birmingham to Murcia and either hire a car or take a taxi to the site. There is a camp shop which sells almost everything you might need, and a restaurant and bar which are very reasonable so you don't really need to leave the site at all during your stay. The beach is 100% naturist, and is virtually used only by visitors to the site. Accommodation varies widely from luxury apartments on the one hand (with air conditioning and heating) to camping on the other. Full details of the site, together with prices per night, can be found on their new website at www.elportus.com, but if you would like more detailed (and perhaps more accurate) information, please don't hesitate to ask me at an SVSC swim, or phone me on 01452 522896. 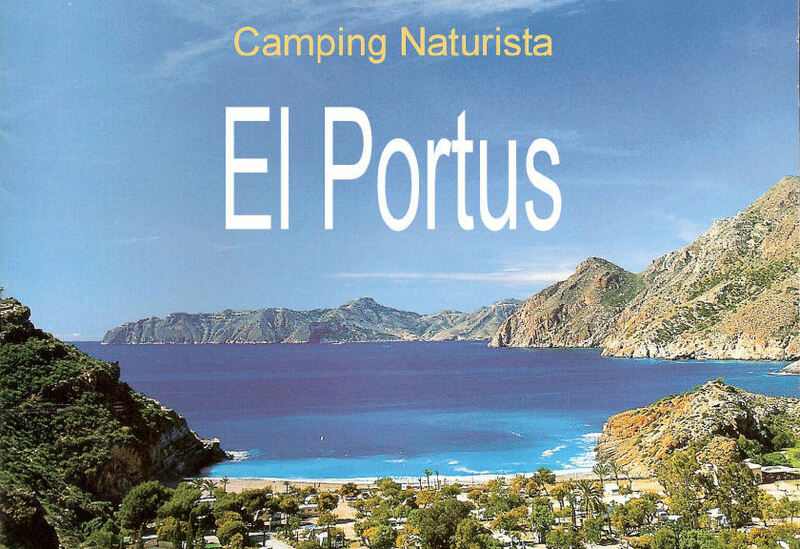 To contact the site, telephone Reception on 0034 968 553053 (they speak quite good English), or email elportus@elportus.com. The address is 30393 Cartagena, Murcia, Spain - but the postal service is by no means as good as ours! Situated on the way to Spain and Portugal and less than two hours far from ferry boat, the camping site of our club CGO offers you the opportunity to stay for a visit of Nantes. The Club Gymnique de l’Ouest is a naturist family club founded in 1950. 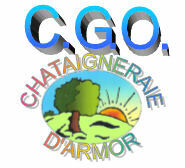 Our field “la Châtaigneraie d’Armor” covers fifteen acres and is located ten minutes far from Nantes city. Friendship, leisure, love of life without clothes make us come together here. A member card of your club will be asked you. Anyway, you will contact us before coming. Members meet regularly for friendly parties in the home and grounds of la Châtaigneraie d’Armor, e.g. meals 14th July and 15th August. The club is open from May to October, but for further details and up-to-date-prices, please contact the club directly. 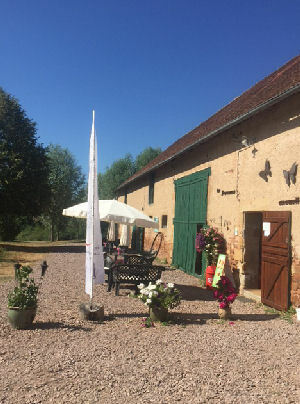 If you are planning a holiday to France and looking for a naturist break, or just want a few days respite from travelling, then Camping Naturiste Les Fourneaux can be highly recommend. The camp site is located near Couzon in central France and like 80% of French naturist sites, it's owned and managed by a Dutch couple, so no language problems there! They speak perfect English. It's an enormous camp site of over 106 acres set in a very rural area and has the largest camping pitches we have ever seen anywhere. It's also a brilliant site for star gazers, with zero light pollution at night. The site we had for our camper van was over half an acre, flat and surrounded by trees which gave us much needed cooling shade. We did of course have our own water and electricity points. The site caters for tents, campers or caravans and has nine "wild camping" areas. The toilet and shower facilities are pristine. Children are catered for, and if you enjoy walking unclothed there are miles of safe walking within the site boundaries. The social side of the site revolves around an old and massive barn. This houses a bar, (serving inexpensive beers and wines) ice cream sales, an exchange library and a small shop. Fresh bread and cakes can be ordered for collection the following morning. From time to time they provide, (again inexpensive), snacks at the bar in the evening. These can be taken as a communal meal or taken back to your caravan etc. There is of course a lovely swimming pool and a small pool for children. 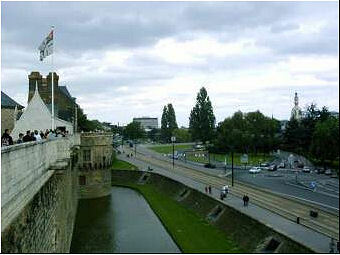 If anyone would be interested and like further details, then visit http://www.lesfourneaux.org/. Alternatively, talk to Howard or Carol who visited the site in July/August 2018.